We assemble ALL our batteries in our factory, using custom parts we design and then manufacture on our own CNC machines. We don’t buy from Battery Pack Assemblers that sell at the lowest price to attract buyers, but then have to scrimp on everything, then assemble them as quickly/cheaply as possible, so they turn a profit. We don’t take chances when it comes to our batteries or your safety! We only source genuine A-grade genuine cells from the official sources. Our EM3ev Super Shark case has a different profile from the Hailong equivalent. This means you can fit this big capacity battery into smaller frames. Our EM3ev Super Shark uses an in-house designed and manufactured CNC cell holder which keeps everything safe, solid and secure. 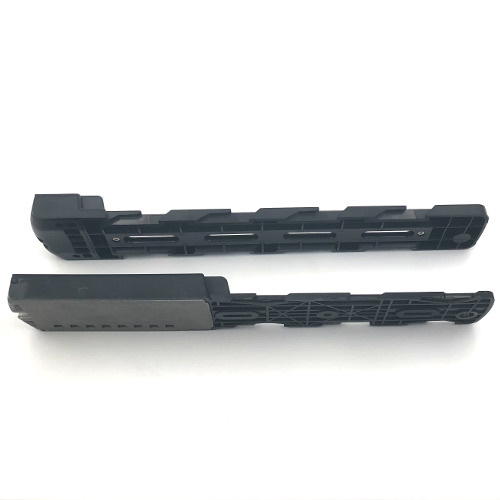 The quality and construction of the injection moulded case is also (in our opinion) far superior and the slider mountings are on a totally other level to the Hailong. The slider is solidly constructed and even has fixing points that match most water bottle mounts. No drilling holes or adding additional brackets to make it work! Every cell in the pack is fused (just like almost all of the batteries we supply). 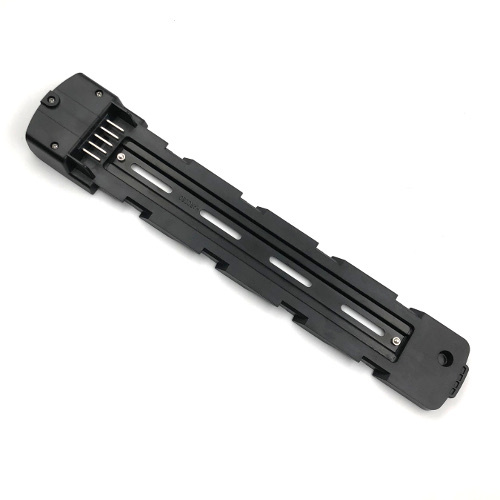 We have been designing and manufacturing (in-house) our own battery terminations for several years already. Cell level fusing, means that in the event of an internal short circuit in the battery (which the BMS cannot protect against), then all that will happen is that some sacrificial links will safely open, preventing any of the cells or cabling from overheating and becoming dangerous. CNC spot welding ensures consistent weld quality and weld position. Safe by design! We use a high tech, fully programmable Smart BMS. With our BMS you can view various battery data, such as: cell voltage levels, temperature, instantaneous charge/discharge current, capacity (genuine SOC, measured Ah and remaining Ah), data log, error indication (on matching LED panel) and it all links to your phone with a continually updated and improved App. Our BMS balances during charging (when charging and when at >50% charge) and therefore doesn’t require a full charge in order to balance. Auto power off function, auto power on and with a pre-charge function (no sparks, so long as the battery is powered off when linked to the controller). A 2 wire type BMS such as ours, costs more (it requires more mosfets) than an equivalent 3-wire type, but it means that the battery can be safely paralleled with another equivalent battery and also means it is fully protected against over-charge in every situation (impossible with a 3-wire type BMS that are generally used in this application). 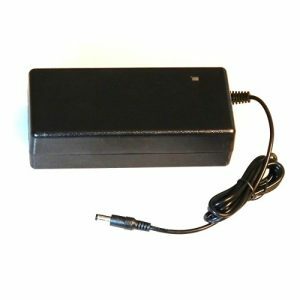 High current charge plug comes as standard (approx. 8A rated). We do all this and offer it at our usual low pricing, we don’t charge a premium for Safety and Reliability. Just because we offer low prices, it doesn’t mean we don’t stand behind our product if there is an issue. We have a proven track record of offering great after-sales support and warranty repairs/replacements. We will not leave you stuck (1 year Warranty, with several Support Centres World-Wide). Our batteries are designed to be easily repaired if the need arises. The Shark style case is a popular choice, due to it’s small size, for it’s relatively high capacity. It’s long, but sleek profile, means it can fit into most frames and it looks pretty good. However, it was not all good. 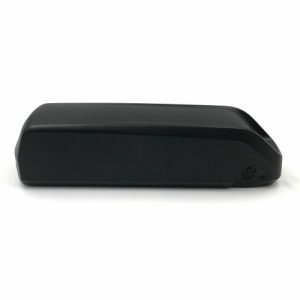 The Hailong case that was used for most of the Shark batteries that are in circulation, suffered from several issues. There is space for a controller on the Hailong Slider. This controller (that is rarely even fitted) takes away valuable space from the battery. It also means that the slider mounting points do not align with the water bottle mounting points on most bikes (some will drill a hole through the controller and add an additional bolt, or even drill a hole through their bike frame..). The slider section on the Hailong is only thin plastic, with no metallic structure. The tabs on the base of the case and the slider (these hold the battery to the slider) are very thin on the Hailong case (~2.7mm) and poorly supported/designed. Also, due to the Short length of the slider (due to the controller), there are only 6 tabs. Thin materials used throughout the case, with little supporting structure. Typically, the material thickness is ~2.8mm. 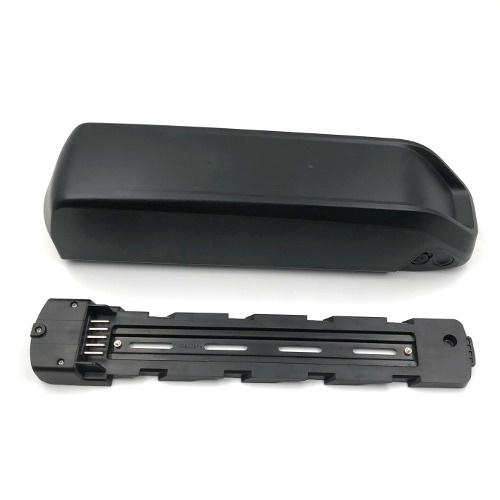 The Hailong Case is designed for 52 cells (13 series, 4 parallel), which is commonly referred to as a 48V battery. In order to fit the additional cells to make it into a 14 series, 52V battery, the standard cell holder must be discarded and the cells glued together. 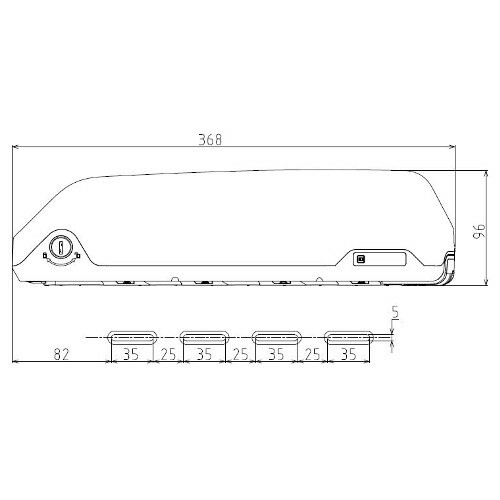 Without the cell holders, safety is compromised and the removal of the cell holder structure, will not help with the case’s structural integrity. Hailong cases were generally only supplied with a DC2.1 charge connector. These are rated 3A (which is not much for a battery that might be almost 14Ah in capacity). The controller case in the slider (that most do not even use) has been removed, freeing up space to make a 56 cell (52V) battery, without compromises. This 36V (10S) version uses 50 cells. 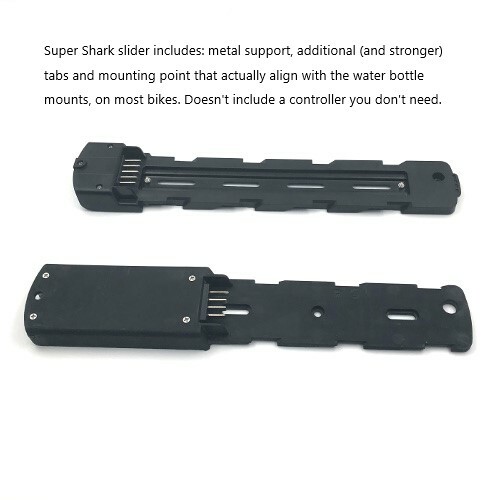 The slider on the Super Shark has a metal support and it has fixing points along almost it’s entire length, so you shouldn’t have any trouble to fit it to the standard bottle mounts on most bikes. The tabs on the base of the Super Shark case are ~5mm thick and well supported. There are 8 of these stronger tabs and they are more evenly spaced along the entire length of the battery. Material thickness is ~3.3mm or more and there are numerous supports within the case, to improve rigidity and strength. 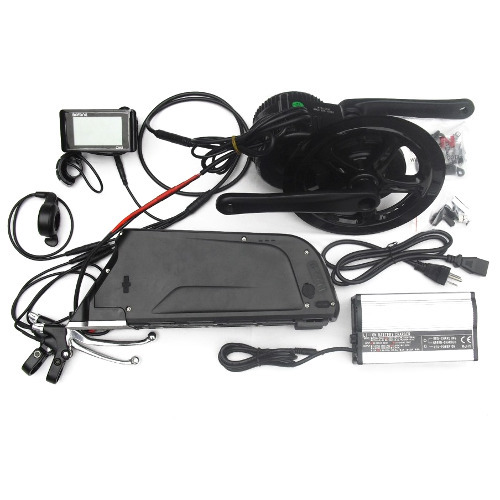 The 10S EM3ev Super Shark case is designed for 50 cells, including cell holder and BMS. We design and manufacture the CNC cell holder, so it is a snug fit inside the case. 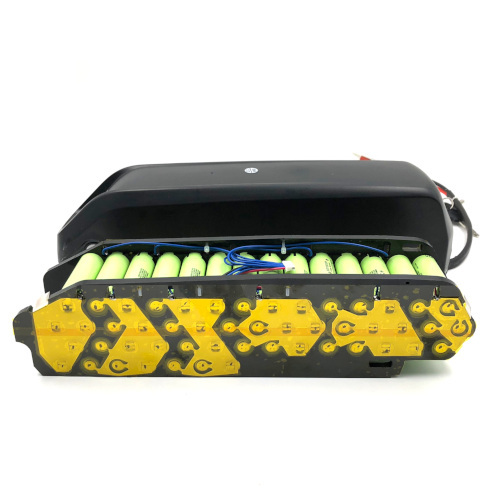 We have designed and manufactured custom terminations for this layout, with cell level fusing on every cell, whilst also minimising voltage drop, to make the EM3ev Super Shark 1 of the safest Ebike Batteries on the market (regardless of price). 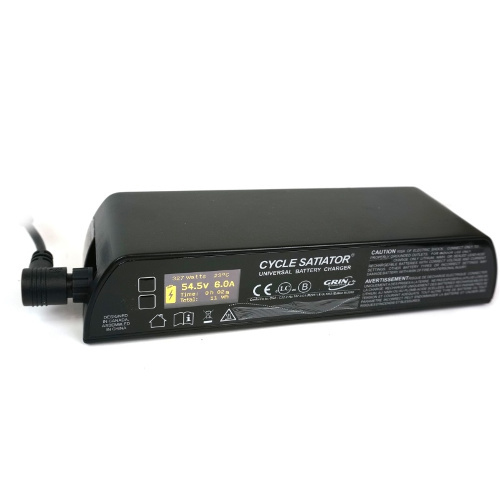 We have fitted 1 of the most advanced BMS you will find in any Ebike Battery to keep the battery safe, performing 100%, to be reliable for the long-term and to give the user access to data for info and diagnosis. 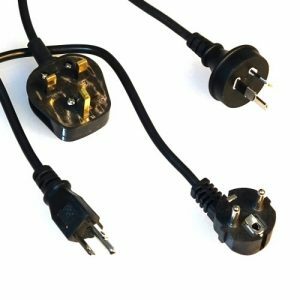 Our Super Shark comes with a high current charge plug, rated for around 8A. Our 2-wire type BMS means you can actually safely charge through the discharge leads as well. EM3ev builds battery packs (and design/manufacture most of the key component parts on our own high-tech machines). We have been assembling all our own battery packs since around 2011. We build our own battery packs, as we want to do things right, we want to do everything we can to make our batteries safe and we want to innovate. 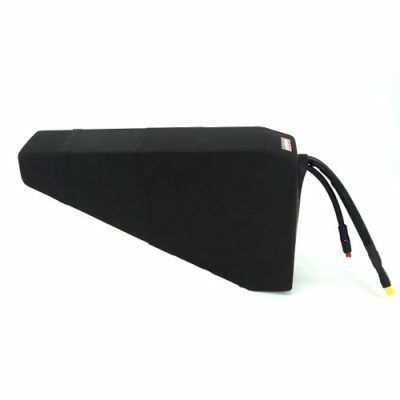 EM3ev packs are always conservatively/accurately rated with regards to both their capacity and the discharge current they can provide, which will help to ensure our packs provide a long and reliable service life. On top of all this, we stand behind our products (1 year warranty). 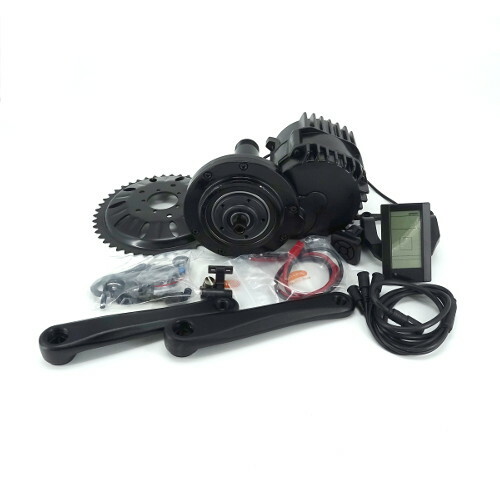 And WE WILL fix any issues that occur (with minimum inconvenience, no cost to the customer and no we do not ask customers to return parts to China!). Here at EM3ev, we are not about hype, spin and self-promotion, our reputation was built the old fashioned way, by happy/satisfied customers. 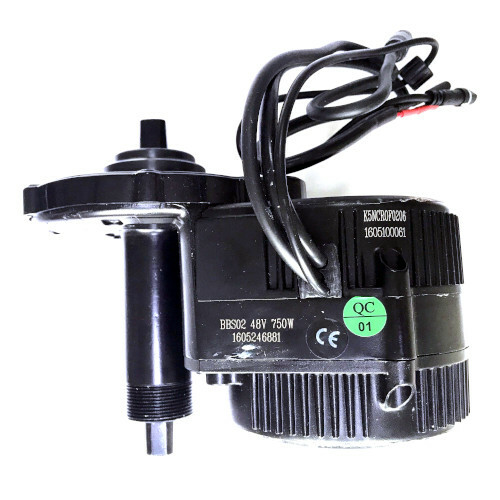 42V 2A (fan-less) or 6A charger (with fan) are optional extras. These are good quality chargers (very reliable in our experience). (The charger may differ from the images shown). We conservatively rate the cells as 2.85Ah (Panasonic PF) and 3.4Ah (35E). Although the makers classes them a little higher than this. Like with any Li Ion type battery, best long term performance is obtained by not using all of the available capacity all of the time, and also, by not using the pack at high discharge rates which will cause excessive cell heating and premature aging. Cycle Life estimated at 500-700 cycles plus (1C discharge to 2.75V, 1C charge to 4.2V). Cycle life is extended by charging to 90%, limiting discharge to 90%. Our 5A charger has a switch for either 90% or 100% charge, or choose the Satiator for even more control. Our BMS doesn’t need a full charge to balance the pack, it will happily balance the pack with only 80 or 90% charge. Cycle Life will be reduced if the Pack is regularly used at continuous high discharge rates (our BMS does have over-temp protection if the battery gets too hot and the battery temperature can be seen in the BMS App). Therefore, please match the battery pack to the rest of the kit to get the performance and long term usage you expect (see our suggested max discharge current below, for our recommendations). Note: the cell manufacturers specs are higher than our recommendations above. It will not harm the battery to occasionally discharge at higher levels than our recommendations, but regular, sustained high discharge rates will degrade the battery more quickly and the battery voltage will sag at these high power levels. The Battery BMS is programmed to trip if cell temperatures reach 60degC during discharge and 45degC during charging. Panasonic PF: 36V nominal, 14.3Ah, ~515Whrs. Samsung 35E: 36V nominal, 17.0Ah, ~612Whrs. Note: the above figures are on a new battery in warm weather and at a discharge rate of ~0.5C. Cold temperatures or high discharge rates will result in reduced capacity. Capacity will degrade over time and usage. Maximum dimensions of: 88mm thick. 96mm tall, 368mm long (See the outline drawing in additional images, for details). Weight: approximately 4.7kg for all cell types (including slider).